This is a nice little ht. You can buy a 2 meter/440 version or a 2 meter/220 version of it. Know need to know the cut off of ham coverage as the ht is programmed not to transmit on non ham frequencies. This HT is also good for listening to MURS frequencies, and scanning. 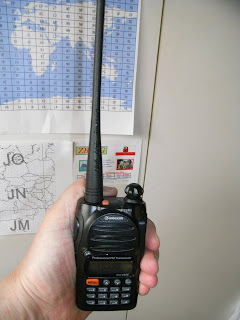 It can also be used as a flashlight and you can listen to broadcast radio. Easy to work with for satelites!